From the number of new Lenormand decks and books on the market it’s clear that the groundswell of interest in Lenormand, which started a few years ago, has turned into a tidal wave! This is definitely more than a flash in the pan, so what does it mean? The deck first appeared in Germany in the late 18th century and came with a standard, some would say, rigid way of reading the cards. Does the 21st century fascination with Lenormand signal a new stage in the evolution of how the deck can be used? In the new age, should we abandon the traditional method of reading the cards and go for a more intuitive, free-flowing approach? Internationally renowned Tarot author and teacher, Mary K. Greer, whose interest in the deck has led her down the path of teaching Lenormand, is a firm believer in the value of the traditional method. In her introductory course of five classes on Global Spiritual Studies, Mary teaches the traditional method with minor adjustments to take account of today’s world. In her two Advanced Lenormand classes, she explores a few topics in greater depth, and again taking a traditional approach. Here I talk with Mary about the difference between a traditional and intuitive approach to reading the cards. First up, a reminder of where the cards originated. Mary: The Petit Lenormand is a deck of 36 fortune-telling cards featuring simple images like a dog, house, and anchor. It first appeared in the 1790s in Germany, and was redesigned in 1845, soon after the death of the French fortune-teller, Mlle. Lenormand. The German publisher simply co-opted her famous name for promotional purposes as was common with occult and fortune-telling works. Although Mlle. Lenormand used a variety of card decks, she never created her own nor did she pass on her reading methods. Used primarily in Germany, Belgium, the Netherlands, Eastern Europe and France and known in the United States in the 19th century, Lenormand cards didn’t achieve the wide-spread popularity in English that Tarot did until very recently. 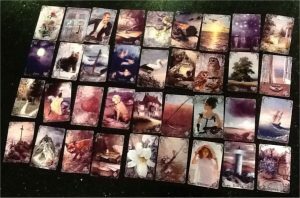 Linda: What is traditional Lenormand? Mary: The Lenormand deck originally came with a single sheet of instructions containing specific card meanings and a single spread. Translated into half-a-dozen languages, this sheet was included with every deck until quite recently. The pictures are emblems with specific meanings, not symbols with infinite ones. Thus, the meanings and method are clear, well-known and still used today. These meanings focus on general areas of danger and difficulties and of pleasure and success in one’s mundane life with no metaphysical content. They best address questions about what has, is, or will happen, like the plot of a story. Among other things, they can also help with describing people and finding lost objects through identifying particular clues to look for. Tarot, by contrast, was originally a card game. Divinatory meanings, techniques and occult symbology were added nearly 350 years after its creation. There are significant variations according to different authors. Each symbol on a card can have an infinite number of references held together by a broad, allegorical theme. Tarot is used as much or more for spiritual guidance and personal development as it is for fortune-telling. Linda: I’ve heard a lot about so-called traditional Lenormand versus intuitive Lenormand. What’s this all about? Mary: At heart is the idea that one can either read the cards by following a rigid system or by using the cards as a trigger to one’s own intuitive impressions or psychic messages. Psychic messages come from an external, non-physical source. Pure psychic (extra-sensory) information doesn’t need an external tool, except, perhaps as a focus, so one isn’t really “reading Lenormand.” Traditional and intuitive approaches aren’t always mutually exclusive. Intuition, which is based on an instantaneous leap or perception of a meaning or pattern based on the sensory evidence and experience, benefits from knowledge about the tradition, which limits possibilities and lends precision and concreteness to an answer. Personal assumptions, bias and opinions can easily be taken for intuition, so a cross-check mechanism is beneficial. Intuition works best when it perceives patterns in the data laid before one; prior knowledge helps you see relevant meaning in those patterns. Like learning a foreign language, at some point you forget the rules and individual words and find yourself speaking fluidly. Cards from a Russian deck known as the Lilac Twilight Lenormand. Most traditional readers are very intuitive. Once you know the meaning and methods of the cards you can see at a glance what the cards are saying, plus you can double-check your insight by briefly reviewing the roots and, in larger readings, checking other cards related to the question to see if there are counter-indications. Furthermore, other traditional readers are likely to draw the same conclusions—you speak the same “language.” I saw this happen when a friend and I were looking at her Grand Tableau at a conference. Over two days we asked several different Lenormand readers (who had learned independently of each other) what they saw, only to have them report almost identical observations. I’ve followed hundreds of personal readings in on-line study groups and found that the majority of interpretations reported as accurate were by traditional readers. Whereas those who confessed they were just saying what they “felt” were rarely spot on. Additionally, these “intuitive-only” readers often answered predictive questions (“Will I pass the exam?) with advice rather than a prediction, a teaching rather than a description. For instance, instead of seeing indicators of whether the querent would pass the exam or not, the intuitive reader might say, “I feel you’re over-stressed and not getting enough sleep. Have some camomile tea tonight and know that you’ve done everything necessary to get the result you really want.” It’s nice advice, but it doesn’t answer the question, and may have little or nothing to do with the traditional meaning of the cards. The traditional method of reading Lenormand is to read all 36 cards in a layout known as the Grand Tableau. Modern traditionalists often use shorter layouts that are segments of the Grand Tableau, allowing one to focus on a very specific question, using a specific syntax for clarity. Cards modify other cards according to explicit rules. Intuitive-only readers tend to go with their “impression” of whatever strikes them most strongly. Or they may favor Tarot-like spreads where each card is interpreted separately in terms of its position meaning. There’s a tendency to see the good in negative cards and to seek a positive outcome or perspective. Traditional Lenormand, on the other hand, can sometimes be quite harsh, telling one definitively what he or she didn’t want to hear. Linda: Can you give me an example of a traditional interpretation? From Madam Morrow’s Fortune Telling Cards (New York: McLaughlin Bros., 1886). 8-Coffin – 15-Bear – 28-Man. Coffin+Bear: sickness; envy and jealousy. The applicant may have experienced his own loss: of a former job, money or health. Bear+Man: the querent’s good fortune creates envy in another (Bear is modified by a negative card). Coffin+Man: a serious loss on the part of the querent. Coffin could indicate a simple “no, don’t hire the person” but might also point to the fact that the loss of one employee has necessitated the hiring of another. Modern referents have been added to the traditional ones in order to fill in the gaps and make the cards a little more concrete. But, while some variations occur, the core meanings should always show through. Man is still the querent. Cards to the left of Coffin show what is lost (money, health, etc. ), while cards to the right may indicate a new beginning. (Modern thinking has added the meaning of box or container to Coffin but that’s not applicable here.) Bear has accrued meanings of strength, power, authority and stored money (invested or saved), while keeping the warnings about envy and jealousy. Additionally Bear can indicate one or both parents or grandparents (among other authority figures). Given a different question these cards might point to the loss of a parent; it’s worth checking. The subject is still Coffin; the next card modifies the subject, like an adjective, indicating financial loss or loss of strength. The Man (querent) needs to be careful as this new applicant is not a good risk. At worst, he might embezzle money from the firm or try to overpower the querent (be “overbearing”). We can see that the modern traditionalist has a little more latitude for interpretation and the possibility of richer details of which an intuitive person can make much. Someone who really knows their core meanings can easily check the story they’ve intuited against the original meanings for verification. This could go so many different ways, yea or nay, so here’s just one possibility. This person knows some meanings for the cards but not all of them; it’s kind of hit-or-miss, but once a story element is discerned it tends to be elaborated upon; subsequent elements are fit into that original scenario, like the wicked step-sisters trying on Cinderella’s shoe. Emphasis is on the cards by themselves in past, present or future positions, rather than modifying each other. At times the card’s art is scanned for symbolic possibilities. The tendency is to “over-answer” the question and try to convince with too many details. A traditional short reading requires a quick survey of card keywords, integrating them into fresh concepts according to a syntax or structure, to determine a succinct, specific, concrete answer to the question. Linda: How does one become a traditional reader? Mary: There are both websites and online study groups at Facebook (search on Lenormand) and tarotforum.net that will help you practice and give direction. There are outstanding forums and websites in languages other than English, too. Or take my introductory course here at Global Spiritual Studies! There are five classes available as a set of five DVDs or as recordings you watch online. You get handouts, homework assignments, as well as step-by-step illustrated instructions. Learn the cards as part of topic groups that make it clear how those cards interrelate with each other. You also become comfortable with the small layouts that make up the greater structure of the Grand Tableau. Twice a year I’m available through an online forum to answer questions, discuss homework and so on. If you’ve already done the introductory course or are familiar with the cards, consider my Advanced Lenormand course. The Essential Lenormand by Rana George (Lllewellyn, 2014). The Complete Lenormand Oracle Handbook by Caitlín Matthews (Destiny Books, 2014). Both Rana George and Caitlín Matthews have written comprehensive books on reading Lenormand. There’s so much information in them that it can seem overwhelming at first. Take your time, be sure to lay out your own cards when reading the examples so you can see exactly what they’ve done. Do the exercises. If you want to start simpler, then I recommend these Kindle ebooks by Anthony Louis and Andy Boroveshengra. Get both! Andy’s is full of his practical wisdom and experience, and Anthony’s is a treasure-trove comparing the early writings on the Lenormand deck from the instruction sheets in different languages and from the divinatory verses printed on some decks. 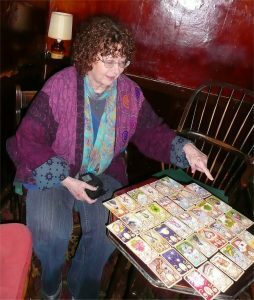 Mary K. Greer has been practising Tarot for more than 46 years and teaches Tarot around the world. 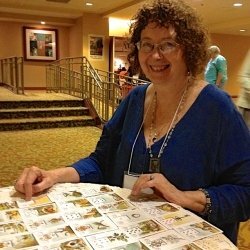 The award-winning author of eleven books on tarot and on magic, Mary is a member of several national and international tarot organizations and is featured at tarot conferences around the world. Her classic, Tarot for Your Self, came out in a beautiful Japanese edition in 2012. In 2007, she received the International Tarot Lifetime Achievement Award from the Association for Tarot Studies. As an independent scholar, writer, teacher, and professional tarot consultant, Mary sees herself as a ‘midwife of the soul.’ She advocates using card reading techniques that are interactive, transformational and empowering and takes a revolutionary approach to teaching that emphasizes personal insight, creativity, and breaking all the rules. Visit her website at https://marygreer.wordpress.com/. Where do you stand on the spectrum of traditional vs intuitive reader? Do you have any comments or questions about Mary’s example of the different answers you get from the same three cards depending on your reading method? We’d love to hear from you! I love Lenormand. And I love the way youve explained what it is how its different and the styles of reading. I have caught myself falling in the trap of intuitive only reading being an intuitive it’s a discipline to follow the rules, so to speak. I did want to add a trick that I use although I’ve never really seen it taught anywhere it always works! My immediate response is this man will not protect your interests. I always like to read the story first. Broken down the subject is the applicant represented by the man card the answer to the action represented by the coffin is no or won’t and finally the action protect and also being the center card gets duality for bank or money. So, 15 + 28 = 43, 4+3=7(snake) This can be considered as a deceitful man or an impending betrayal of the man considered in the future. Mirror coffin and man 8 + 28 = 36 (cross) applicant is nothing but trouble and again the fadic 9 will even apply in conjunction with the negative connotation of the coffin to say he will not appreciate the job or the employer will not appreciate the betrayal. Further more to confirm once more, mice and snake shadowed by the cross tells me hes a thief that will cause burdens likely to lead to crisis. Finally to add all 3 for a shadow context 8 + 15 + 28 = 51, 5 + 1= 6(clouds) further adding to the initial statement, keep moving or stay in transition because…this applicant will fail to protect your interests. 23+7+36 or 5+7+9=3 also indicatice of moving forward, carrying on, the ship has sailed ont this applicants opportunity. It goes on and on. Im not iverthinking it just merely showing the depth, scope and potential for accuracy when using Lenormand.